Recently I was lucky enough to see the amazing Chimamanda Ngozie Adichie discuss her work, the social construction of race, and the politics of black natural hair (among other things) in an event that celebrated the release of Americanah, her first novel since 2006's Half of a Yellow Sun. Adichie began by reading from the first chapter of Americanah, after which she talked a little about the novel. The story opens when Ifemelu, one of the two central characters, decides to move back to Nigeria after thirteen years in America. Adichie said she particularly wanted to explore the construction of racial identity: at one point, Ifemelu says that she only became black when she moved to America, because in Nigeria the way she looked was the default. Since race didn’t have a strong impact on her everyday life, she didn’t think of it as central to her identity; for her, black is an added category and not something she grew up thinking of herself as. Her experience is therefore very different from that of people of colour born in America, who have never been allowed to forget race because their social environment constantly reminds them of it. Adichie also said she wanted to write an immigrant story that focused on middle-class African immigrants rather than on the disadvantaged or on war refugees. Obviously the latter have stories that are also worth telling, but she wanted to complicate our understanding of African immigrants by focusing on two characters — Ifemelu and Obinze, the other point of view character — for whom emigration was a choice. Ifemelu and Obinze have lives of relative privilege, but they dream of moving to American (whose wealth and cultural prominence make it their chosen destination) because they want options they don't feel are available to them in Nigeria. Their experiences in the US and in the UK (where Obinze, denied an American visa, ends up) therefore entail a loss of privilege and social prestige that Adichie was also particularly interested in. Having now read Americanah, I can say she did a brilliant job of exploring this kind of experience: what is it like for two smart, relatively well-off and high achieving young people to find themselves in an environment where they are suddenly "other"; where they're perceived as less; where being who they are suddenly closes doors to them? Adichie's two main characters both feel themselves reduced upon immigration, and experience a side of life they'd previously been sheltered from. She was additionally interested in comparing immigrant experience in the US and the UK — especially because the intersection between race and class in the UK complicates matters. Adichie's goal when writing Americanah was twofold: she wanted to write an old-fashioned love story and she wanted to write a funny novel. Regarding love stories, she said she'd like to see more acknowledgements of their legitimacy and fewer dismissals of romance as "frivolous". She pointed out that as the first few reviews of Americanah started coming in, she noticed that some critics were very careful to say, "it's not just a romance, there's social commentary too! ", and all the while she was thinking, "Well, what's wrong with romance"? Regarding humour, she wanted to write a funny book because she thinks there's something inherently absurd about racial categories. The consequences of race in people's lives are obviously serious, but the fact that we long ago started attributing such importance to this one aspect of human variation is nonsensical, and she wanted to highlight that in a way she feels that an African rather than an African-American is better positioned to do. Lastly, we got to the subject of black hair, which plays a central role in Americanah: Adichie said that hair is a complicated issue for black women because what their hair generally looks like defies conventions of beauty. Afros are stigmatised, and most women end up straightening their hair with very abrasive products because they're told they won't look "respectable" or "professional" otherwise. Black hair is policed, and this makes it a political issue. If you have natural hair, people assume you're a radical out to make a statement; they never consider you're perhaps just tired of fighting nature to conform to a definition of beauty that isn't yours to begin with. Obviously this does amount to making a statement, but having their politics scrutinized by strangers because of how they look is not something black women should have to go through. Adichie added that it's very hard to break out of this pressure, even if you know better: it took her many years and a deliberate conscious effort to stop straightening her hair. The idea that natural black hair was ugly took hold on her, and for a very long time she genuinely couldn't stand the way her natural hair looked. The matter is of course made worse by the fact that natural black hair is never really seen in pop culture or fashion magazines — except in "before" photos in makeover features. Black hair is portrayed as a problem to be solved, and this makes things very difficult for young black girls growing up surrounded by these images. We need to talk about why natural black hair is only perceived as acceptable if you're an artist, a poet, a musician or a political activist — never if you're "respectable" or "professional". We need to talk about what the forced transformation of natural markers of blackness implies. 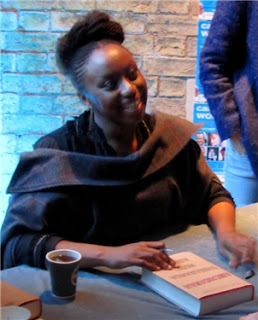 There are two further points in my notes that I can't fit into the narrative flow of this post, but that I wanted to share with you anyway: one is that Adichie called herself "a happy and fierce feminist" and said she always makes a point of having a multiplicity of female voices in her novels. She's interested in defying ideas of what constitutes femininity, and she can think of no better way of doing that than by telling stories about a variety of women. The other is that she said she hoped Americanah would be a hopeful novel even though her characters go through very difficult circumstances. It's a novel about not belonging or fitting in, but she hoped to show that the possibility of human connection was nevertheless always there. I don't know that I'll ever blog about Americanah, so I'll use this as an opportunity to say that I finished it last weekend and absolutely adored it. It's funny, moving and thoughtful, and very different in tone from Adichie's previous work. But what is versatility if not the mark of a great writer? Oh how I wish I could have been with you to hear her talk--sounds like it was incredible! She truly seems an awesome person. I can't believe I still haven't read any of her books. Well, I can believe it obviously, but I'm more than a little irritated with myself about it. Though I now have an even bigger decision to make when it comes to the "which book first?" question. Oh, I'm so jealous you got to hear her speak in person! I adored Half of a Yellow Sun. Will be hunting Americanah down as soon as it's available over here! How lucky that you got to hear and see her in person. I want to read Half a Yellow Sun and this new one as well. I have a very dear friend in my office who is from Nigeria and he has been recommending many good African authors for me to try. It is sad that I have read so few in my life, so far. It sounds like an amazing talk. You always do such interesting recap posts of the author events you go to. I must have forgotten that Adichie had a new book out this year -- since it's the year that every awesome author in the entire world has a new novel out, it's been hard to keep up with all of them. Sounds like a wonderful talk. I've yet to read any of her books, but she's coming to DC at the end of this month, and I've been thinking of going. I'm going to make every effort to do so! Excellent recap! I love that she's a "happy and fierce feminist!" I heard her talk a few years ago and she came across as a very assured woman who really thought about what she said. I still haven't read her last book but I really want to read this one! Reading your recap of Adichie's talk makes me want to read Americanah right. now. Still wish I could have been there too! I'm glad you managed to write it up, though, it sounds like the talk was fascinating. Thank you for sharing this meeting with us - Adichie sounds amazing! I have had Half of a Yellow Sun on my TBR list for some time. I need to move it closer to the top. Thank you for sharing this! She is definitely one of my favorite modern authors.